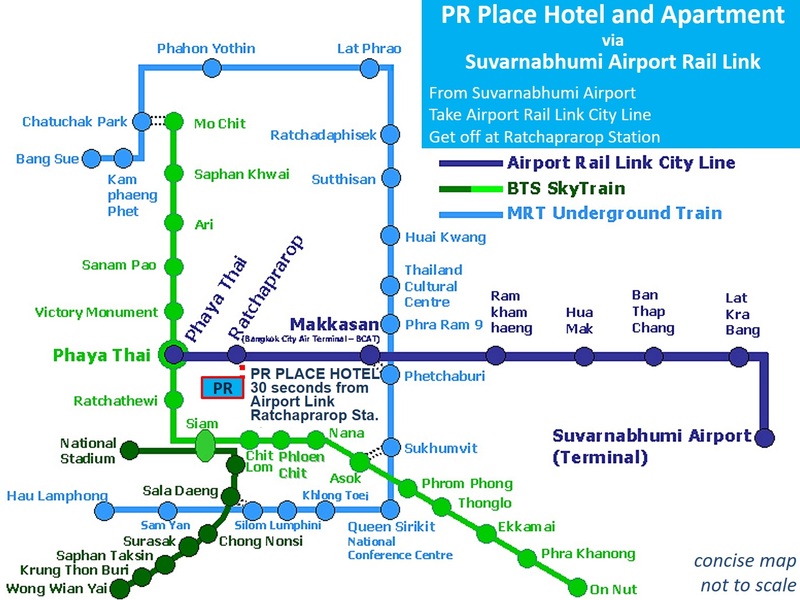 Please take Airport Rail Link Train (City Line) from inside the terminal and get off at Ratchaprarop Airport Rail Link Station. 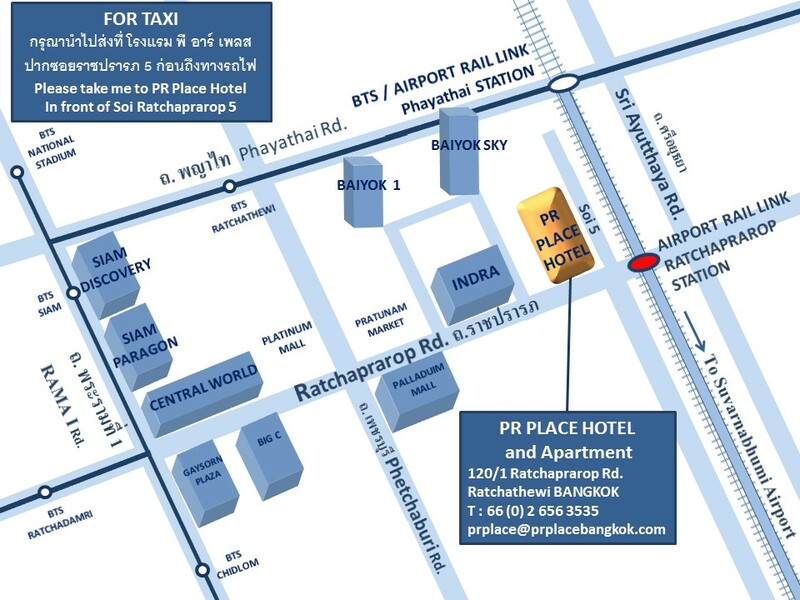 PR Place is just 30 meters away from the Ratchaprarop station. The train will take approximately 25 minutes and cost approximately 45 baht (subject to change). Please check with the counter for the rates. Please contact Taxi Counter, Level 1, near Entrances 3, 4, 7, and 8. Fares: Metered fare plus 50 baht (passenger pays for expressway tolls). Please contact Taxi Stand. Fares: Metered fare plus 50 baht (passenger pays for expressway tolls). Please take Airport Bus Route A1 or A2 (identified by the “AIRPORT BUS” light box over the front windshield) at the roadside bus stop. Get off the bus at BTS Mo Chit Station (A1/A2) or at BTS Victory Monument Station (A2). Take BTS Skytrain to Phaya Thai Station. Please take Limo Bus Silom Route. Get off the bus at Pratunam. Guests can normally find a taxi (meter) or tuk-tuk (Thailand's famous 3-wheel open-air taxi) within 30 seconds after leaving the building. Please ask our staff to get a taxi for you. Please let our friendly staffs assist you regard the route of the bus (both regular bus and air condition bus) once you arrive. The contents in this website are informational only. No representation is made or warranty given as to their accuracy or road conditions or expeditiousness. PR Place assumes no responsibility for any loss or delay resulting from such use.